I get lots of questions about my photography. The #1 place people look at my photos are on their phones (websites, social media, etc), and the #1 tool I use to show people my photos (in person) is my phone. The #1 question I get about the photos is “Did you take that on your phone?” … No. But, what did I use to take that photo? Be Prepared. Tho I’ve already sourced supply stores in each city (as I mentioned in part 2 of this series), I won’t have a lot of time to run to a store so I need to have as much with me as I think I’ll need, and back-ups for those things, and back-ups for the back-ups. Be Light. If #1 is about bringing as much as possible, this one is about leaving as much at home as possible. Airports, airplanes, parking lots full of people, on-field during very large soccer matches, up in the suites in big stadiums… I need to be mobile. I’m a big Alton Brown fan (the TV chef) who regularly talks about the importance of not having “unitaskers” in the kitchen – items that only perform 1 task. Packing for a trip like this is much the same, as much as possible. So, what do I take and how do I get it there? 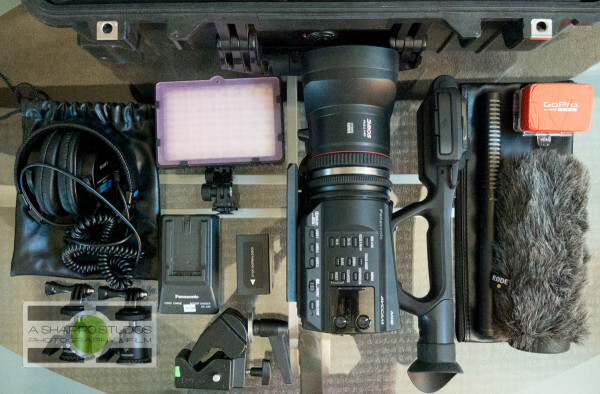 My team and I are tasked with capturing both stills and video onsite and everything pretty much fits into 2 kits. 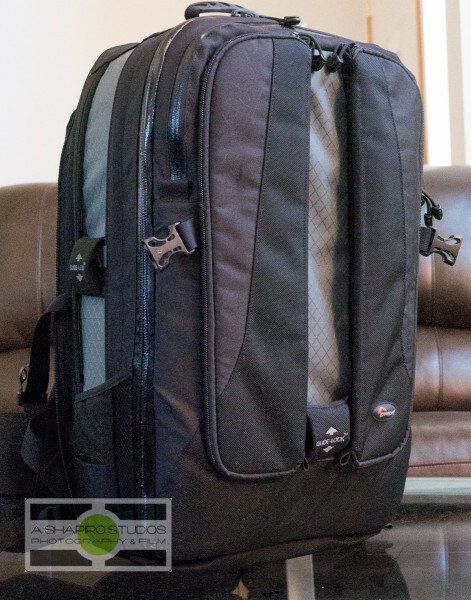 The Still Photography kit travels in a Lowepro Vertex 300 backpack-style bag and also carries all the computer/storage gear. 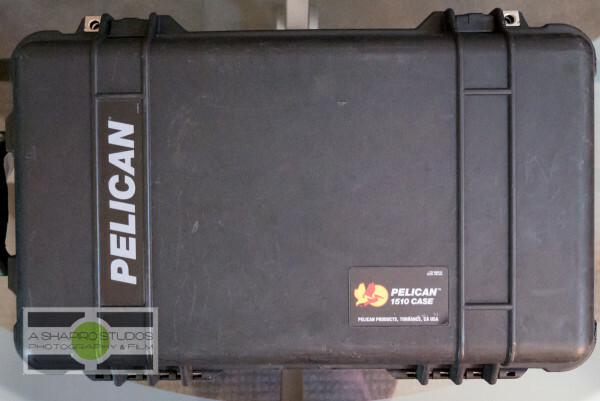 The Video kit travels in a Pelican 1514 (a Pelican 1510 that’s been outfitted with foam dividers). Let’s start by looking at the still kit. The core of the still photo kit are the 2 dSLR camera bodies – A Nikon D800 and a Nikon D750. The D800 will get mounted with a Nikkor 28mm f/1.8 lens and the D750 will get a Nikkor 28-300mm zoom lens. The D750 will do most of the work, especially once in the stadium. Also mounted to the D750 will be a Nikon SB-910 speedlight that will get used pre-game when shooting into the sun and after halftime once in the suite. I’ll have a couple PocketWizard Plus III triggers with me in case I want to mount a flash or camera somewhere fun and trigger it remotely. For that, you can also see a Joby Gorillapod SLR-Zoom and a shoe-adaptor for the SB-910. In case I need to shape the light coming out of the strobe a little more, I also carry a Rogue FlashBender. Both cameras have dual card slots; the D800 takes 1 SD and 1 CF card (not shown) – the D750 takes dual SD cards. I use Sandisk Extreme Plus 80MB/s 16GB SD cards for everything – both still and video; I’ll have 16 of them with me. I carry the cameras onsite with a BlackRapid RSD-1BB Dual Camera Strap. Nikon has started using the same battery in many of their cameras; the EN-EL15 battery. Both the D800 and D750 take this battery, and I carry a spare for each camera (for a total of 4 batteries for the Nikons). This will have no problem getting me through the day for cameras, but for between matches I’ll also travel with 2 Nikon MH-25 battery chargers for those batteries. The SB-910 and PocketWizards (along with the keyboard that I’ll get to in a moment) all take AA batteries – I’ll travel with 40 spare AA’s. I’ve yet to find a hotel room that has enough wall plugs; I also travel with a Monster Cable Outlets To Go power strip that gives me 3 plugs. For computing/processing/editing, I travel with an Apple MacBook Pro 13″ (that’s several years old and needs an upgrade – not pictured). It’s easier to use sitting on a table/desk a little further away from me, so I also bring along an Apple Wireless Keyboard (clipped into an Incase Origami Workstation – which also works with the first-generation iPad, shown) and a USB mouse, and of course a power adapter. I also carry a notepad and a couple pens/pencils etc in case I get the urge to write like it’s 1915 instead of the modern day. It can get kinda dark in the stadiums, so I also bring along a Fenix TK09 flashlight. The binoculars, REI 8-17mm zoom, are good for spotting player names or people in the stands wearing shirts or scarves they got in the fan village. Earbud headphones are a must as well as a fist full of business cards, plus my 2 accessory pouches. Also not shown are a pair of Bose noise cancelling headphones for the airplane. You can also see a charger for the Panasonic GX-7 battery; I used the GX-7 to take these photos (so it’s not shown either). Yeah, I’m also taking sunglasses and sunscreen with me, but those aren’t shown either. Also not pictured are an old iPhone 5 that I use exclusively for listening to music and podcasts, and the 2 Lacie Rugged 1TB hard drives that I’ll talk more about in Part 5. 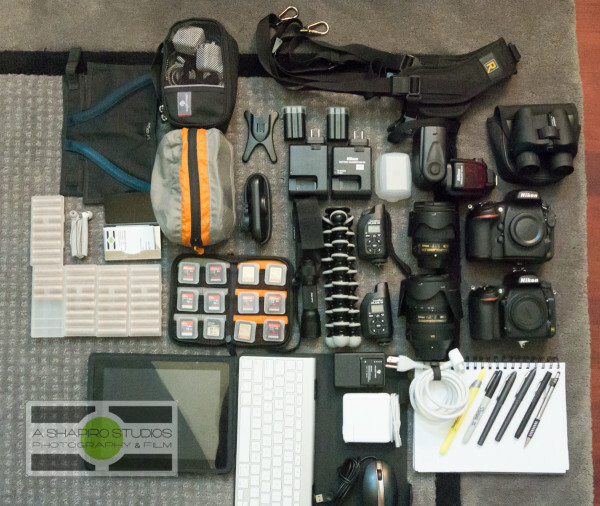 Everything on the bottom of this image goes in the grey/orange pouch – the one I use for camera-specific stuff. Included are cables for the PocketWizards, small flat head and phillips head screwdrivers (the phillips head isn’t shown), a hot shoe-to-1/4-20 adapter, ear plugs (mostly used at music venues but they’re small enough to travel with me everywhere), a small lens cleaning cloth, a tripod plate (with spare mounting screw), some miscellaneous hardware and – yes – more SD cards (and Micro-SD used for the GoPro, below). 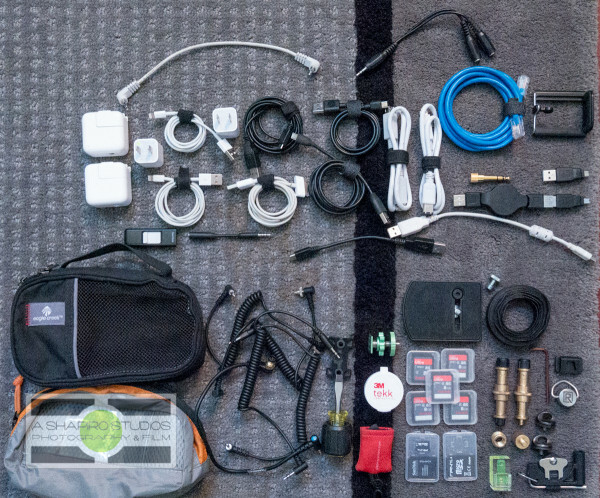 Everything in the top part of this photo goes in the black pouch – the one I use for charging and goes in my messenger bag every day. This includes 2 12w USB wall chargers and 2 5w USB wall chargers, along with 2 Lightning and 1 Dock cables, plus an army of both mini- and micro-USB cables, an 1/8″-to-1/4″ audio adapter, a headphone splitter, a FireWire 800 and a FireWire 400 cable, a short audio patch cable (used mostly in rental cars) and an 8GB USB thumb drive – you never know when you need to give or get a file. There’s also a clamp for an iPhone (in case I want to mount it to the GorillaPod). And – even tho we live in a pretty advanced society – I still carry a CAT-5 cable in case I’m in a hotel room or office space that I need to plug in for internet (live in the now, man). 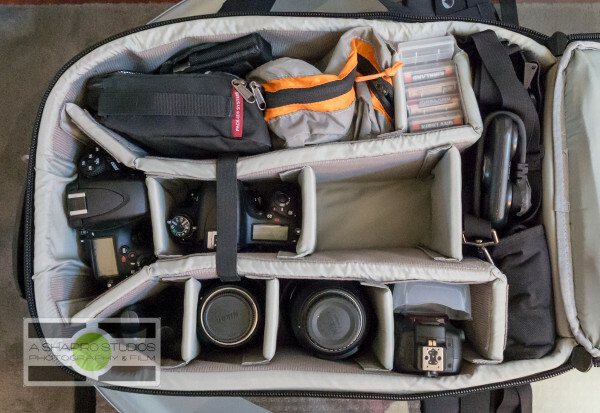 Everything packs up really nicely into the Lowepro bag. After the still kit, the video kit is a little straight forward. The core is a Panasonic AC90. It uses the same cards as the Nikon cameras – I also carry a spare battery and charger. Audio is captured using either a Rode NTG2 (with a dead cat) or, if I’m interviewing someone, a Sennheiser EW112P wireless lav kit ( packs not shown). Monitoring happens using Sony MDR7506 headphones. 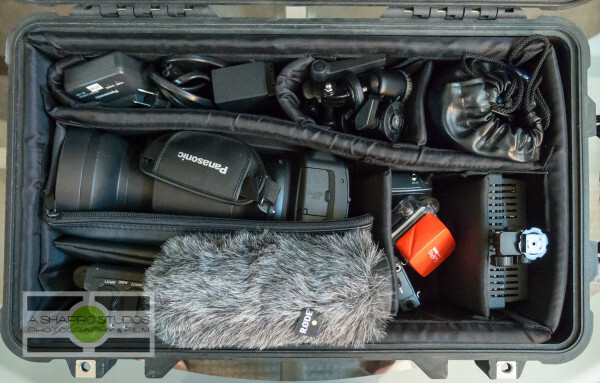 I also travel with a GoPro and an assortment of accessories (like tripod mounts, bar mount and head strap plus a floaty backdoor – just in case). 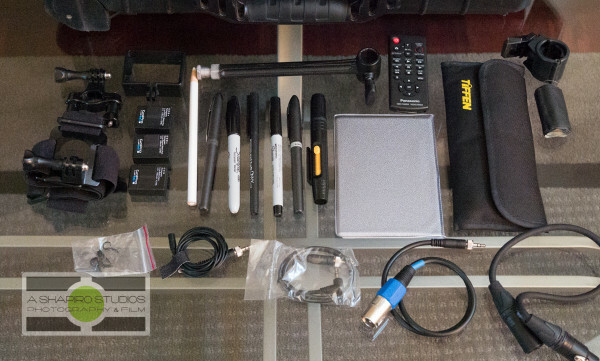 Rounding out video is a super clamp, extension arm, more pens and pencils, and a couple lights – one is the Fotodiox LED panel (which I love because it’s both dimmable and has adjustable color) and Fancierstudio LED panel that’s ‘dumb’ but throws a decent amount of light. Also not shown are a monopod with video head (that comes in really useful on longer days) and a Gerber Multitool (that goes in checked luggage because it has a knife). 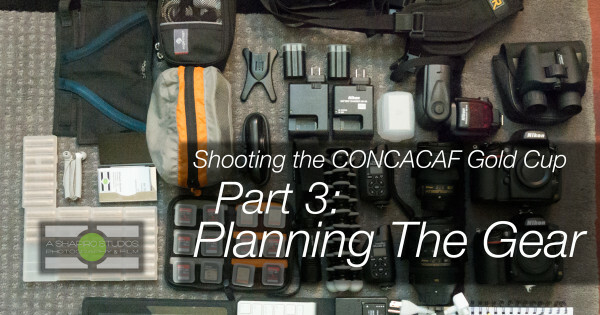 In Part 1 I got the call, in Part 2 I planned the trip and now the gear is ready to go! Monday morning at 5am my flight leaves for Houston for the first 2 events. In Part 4 I’ll have some photos to show you!